I am going to summarize the carbonnades de boeuf à la Flamande recipe (beef cooked with beer) from pg. 148 of Jean de Gouy’s 1895 La cuisine et la patisserie bourgeoises en Belgique et à l’étranger. De Gouy was a notable chef in Brussels who co-founded a culinary review and cooked for Belgian aristocracy. The recipe is rather different than most current carbonnades recipes, mainly because there is no sweetening element in it. Most modern recipes call for brown sugar or a syrup of some kind. Also, de Gouy advises to use “faro ou lambic” for the beer, both of which, especially the lambic, are rather sour. On top of all this, he advises a good spoonful of vinegar! The Brussels taste then, as evident from its famous beer styles, was definitely inclined to the sour side. If the meat used was rather fat, one could see why such a strong sour taste might be wanted, but we have read in North America that grass-fed European beef was always very lean. The recipe says, take a kilogram, or 2.2 lbs., of chuck steak (basse côtes découvertes), i.e., in one piece. Cut it in two centimetre slices, then cut each slice two or three times, sideways that is to make smaller pieces. Flatten each lightly. Sauté “three or four” finely sliced onions so they are blonde or translucent (not brown). Remove them, then in the fat – type not specified, I would use lard, saindoux – sauté meat slices. Of course, add more fat if needed for this purpose. Remove meat. Add two “c. à b.” (tablespoons?) flour to pan and cook gently for five minutes, then add a half-litre of water to make a sauce. Simmer this a bit, not too much but until you have a thin consistent sauce. Pass it through a chinois, this is called here also a China cap or ricer, on the onions and then place the beef in. The liquid should just cover the mixture. (One thing I find unclear in the recipe is if you place the onions through the strainer with the sauce. You can do this if you want a smooth sauce without fibrous bits, it would be onion-flavoured but without the tissues of the onion in it. I think this is probably what was meant. You could try it either way, I find in the cooking the onion tends to disintegrate anyway). Next, add a “strong” bouquet garni, a fresh herb mixture of course (but use good dried herbs if necessary, that’s fine), then add a “spoonful” of vinegar. I’d say two or three ounces. As always salt and pepper to your taste. Cover, cook one hour, degrease carefully, remove the bouquet, then add a quarter litre of “faro or lambic”, and cook “until finished”. This would, here, take normally another half hour or an hour, but it depends on the meat, just let it cook slowly until tender. Either do it on top of the oven or inside at a low setting, the recipe doesn’t specify. I like to do it in the oven, the result always seems better. As for any carbonnades, it is good to let it cool and slowly reheat it when needed. It tends to concentrate the flavour that way too. The classic accompaniment is french fries, which seems odd to us in North America, but the Belgians are masters of frites cookery and somehow the combination works well. I like Brussels sprouts, lightly cooked cabbage, or endive – chicons in Belgium – with it. There is a great recipe from Lille for chopped red cabbage and beer which is easy to find on the Internet, or I’ll give it if anyone asks. 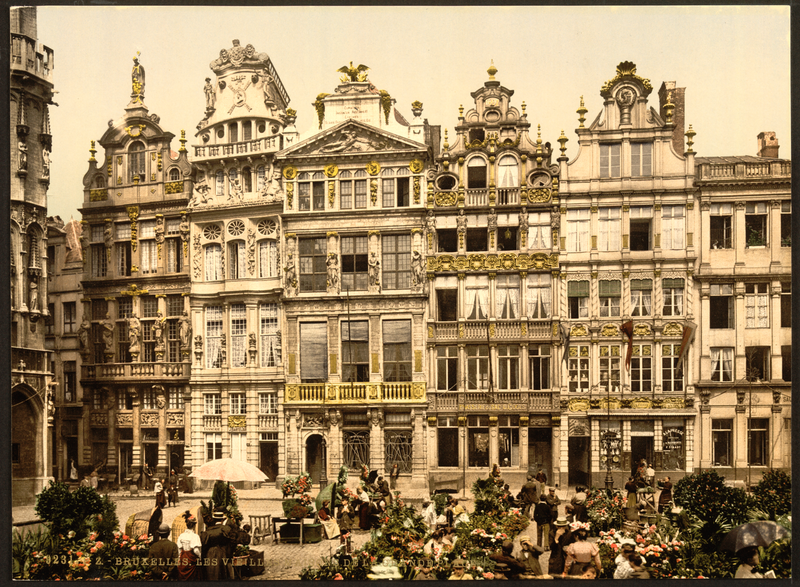 Note re image above: The image, of c. 1900 Brussels, is believed in the public domain and available for educational and historical purposes, it was sourced here. All feedback welcomed. Beer Cookery in Belgium: age-old?